Born on January 16, 1987, in Leningrad. From 2003 up to 2010, studied at St.Petersburg State University, the Faculty of Oriental Studies, the Department of Mongolian Philology (now the Department of Mongolian and Tibetan Studies). In 2006-2007, took an academic training at the National University of Mongolia. 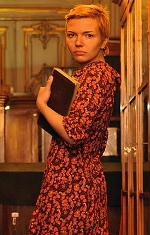 In 2010, obtained the Master degree in Literature. In December of 2010, started her doctoral studies at the IOM RAS, the Dissertation is entitled Literature on the Paths in Mongolian and Tibetan Tradition [«Литература Пути» в монголо-тибетской традиции], supervised by Dr N.S. Yakhontova. From December 2010 up to present, an assistant researcher at the Department of Manuscripts and Documents, the IOM RAS, processes the Mongolian collection. From late 2011 up to present, takes part in cataloguing projects at the Tibetan collection of the IOM RAS. Major research interests: genre theory, Tibetan and Mongolian Buddhist literature, literature on the paths, Lam rim literature.